On this page I present a (half-way) logical data model for Wikka's data: an explanation of how the data "works" and a step on the way towards a better and expanded database. On the WikkaPhysicalDataModel page I explained how I set out to make a model of the (current) physical data structure in Wikka's database and found I could not model all the relationships between the tables because the database is actually not structured to directly support the relationships that logically do exist between the data. So in parallel with creating the physical model, I created a logical one as well by "pulling apart" some tables that logically should be separate but (for unknown reasons) are not now. Adding some keys, and a field, and enlarging a few others, soon gave me a much better "picture" of how Wikka's data all hangs together. "logical" data model. In the downloads section below you'll find a download link for the full-size image. full-size version of the image. 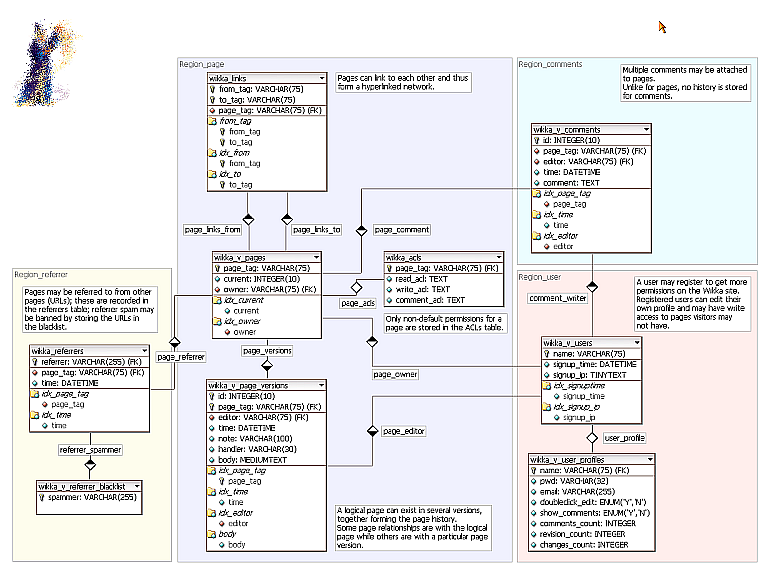 the XML file with the model that you can load into DB Designer 4: it's a free application that is available for Windows and Linux, and released under GPL: well worth a look.